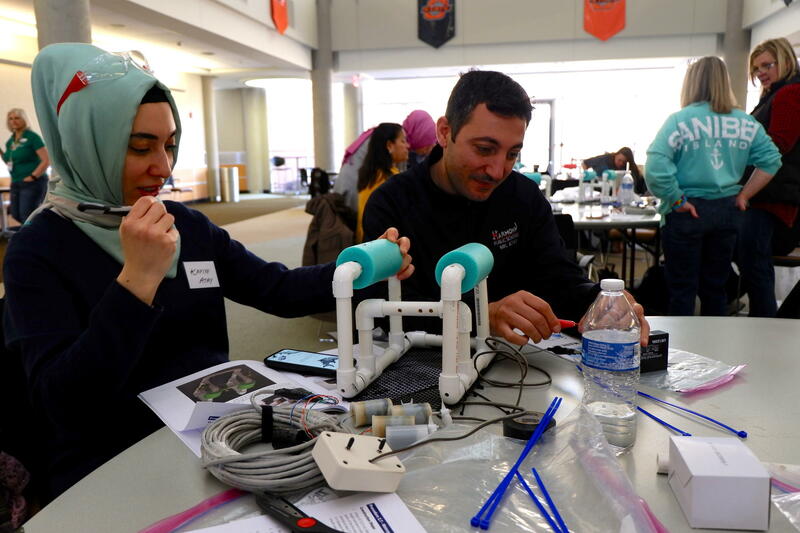 Dove Science Academy physics teacher Kafiye Atay (left) and Dove School of Discovery fifth and sixth grade science teacher Matay Atay work on their underwater robot Tuesday at OSU Tulsa's Helmerich Research Center. The robotics lesson was through the U.S. Naval Academy's SeaPerch program. Some Tulsa-area teachers spent their Tuesday learning underwater robotics. The training through the U.S. Naval Academy’s SeaPerch program showed them how to build remote-controlled submarines out of cheap, easy-to-find parts — think PVC pipes, pool noodles and common electrical components. Emily Mortimer with the Tulsa Regional STEM Alliance said there are several scientific concepts at play that teachers will have a new way to show to their students. "It makes the teachers the experts. And they have the support of the U.S. Naval Academy and TRSA, and so they have the resources and we also offer the grant, so they can actually get the equipment in for their students, to put in their students’ hands," Mortimer said. "So, without these type of programs, it wouldn’t always get to the students." Dove Science Academy seventh grade science teacher Catalina Vizueth said she had plenty of ideas to take back to her students. "I have been able to learn about electrical components of the SeaPerch program, about ocean exploration, about buoyancy, density and many other science-related concepts that students can benefit from what we can apply in the classroom," Vizueth said. Naval Academy professor Patrick Moran said SeaPerch is meant to help find the next generation of Department of Defense employees with science, technology, engineering and math backgrounds. "And, actually, the country in general, scientists and engineers — we’re not producing scientists and engineers at the rate that we need them. So, it’s not just about fulfilling Department of Defense lab positions, it’s also positions across the country as well," Moran said. After learning concepts and building their vessels at OSU Tulsa's Helmerich Research Center, the teachers tested them out at the downtown Hyatt Regency.